Femur upper leg bones (or Humerus Arm bones), get both a left and a right. A set of life-size anatomy femur humerus bones made from durable high quality hollow molded hard plastic. 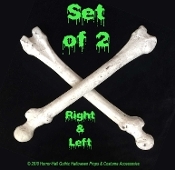 Ideal for prop building, graveyard haunt, cemetery scene, pirate prop or anatomical display. Also ghoulishly creepy holding spooky signs, flags, shrouds and creepy cloth draping! Make no bones about it - this prop is creepy! Approx 16-inch (40cm) long x 2.5-inch (6.25cm) wide at widest and 1.25-inch (3.13cm) at the narrowest.